I didn’t scour the NL Gold Glove Award winners when they were announced the other day. I got my text alert that David Wright and Carlos Beltran had won, and left it at that. But looking at them now, there’s one oversight that stands out — and probably foreshadows similar awards results down the road, though that may not be the case because of the different voting groups. In the NL, there’s nothing to complain about in the awards for Russell Martin, Ryan Zimmerman’s accomplishments. And Derrek Lee doesn’t seem to be quite the glove man that Todd Helton is, but that’s not even the biggest upset in the doling out of the awards, in my mind. Look at shortstop, where Jimmy Rollins won the award for some reason over Troy Tulowitzki. It’s not even that close. In seven fewer games and nearly 70 fewer innings, Tulo trounced Rollins in total chances (834-717), putouts (262-241, with Rollins’ number buoyed by having a Gold Glover in Utley at second base) and assists (561-479). Plus, he made the same number of errors in more than a hundred more chances. And though his fielding percentage was just .002 better than Rollins’, Tulo still put up a better mark with a lot more opportunities — opportunities for mistakes. It’s even more impressive when you see the young Rocky’s advantage in range factor and zone rating. I fear the same fate will befall Tulo when the NL Rookie of the Year AWard is announced, though it won’t be as big a “mistake.” Ryan Braun, the likely ROY, is certainly deserving. I just think Tulo had a better all-around season, while Braun attracted attention for his homer binge more than anything else. 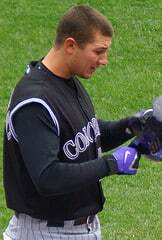 If the ROY is like the Heisman, Tulo will benefit from the Rockies’ late-season run to the playoffs, when he emerged as Colorado’s leader and drew some attention his way for being a better well-rounded player. Braun has also attracted a lot of attention for being the WORST FIELDING 3rd baseman in the last 75 years or so. His defense is an embarrassment to major league baseball and, last time I checked, every player spends HALF OF THE GAME playing defense. Tulo got jobbed on the Gold Glove and Tulo DESERVES the ROY.